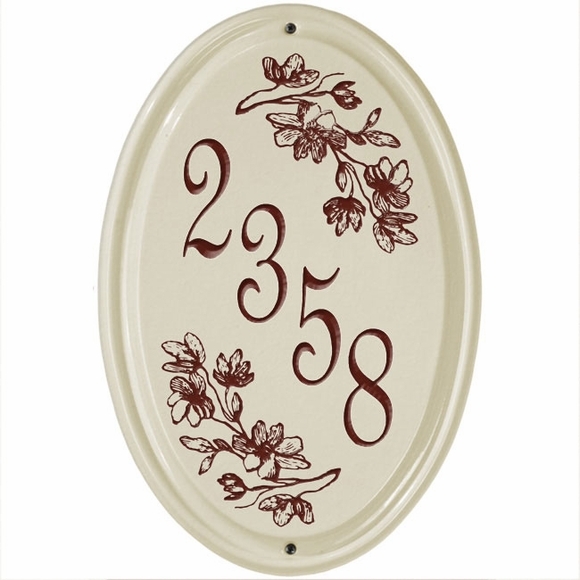 Personalized Ceramic House Number Plaque - - Oval shape wall plaque hangs vertically and fits into narrower spaces. Displays your house number in large 3" numbers. Dogwood accents. This personalized plaque holds one line of text with up to five numbers. Dogwood numbers and design colors: red, green, blue, black. Standard horizontal orientation ceramic house number sign is shown in Related products. It was more lovely than I expected. Great quality and colors!